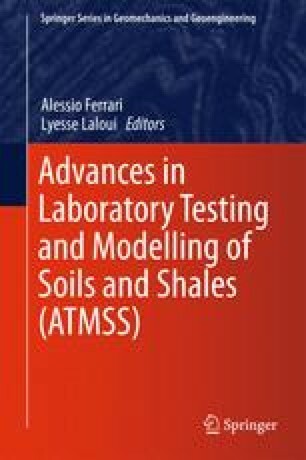 Specific equipment and procedures developed for geomechanical testing of hydrocarbon caprocks were adopted to conduct truly undrained triaxial tests with Opalinus Clay. The amount of pore pressure development during consolidation, and the resulting effective stress, is managed by equilibrating the samples in vacuum desiccators of different relative humidities (vapor equilibration technique) prior to assembling into the test apparatus. We present test results of five Opalinus Clay samples covering a laboratory mean effective consolidation stress range from 5 MPa to 50 MPa. A drained consolidation test was first conducted to determine the appropriate strain rate for consolidated-undrained (CU) triaxial testing. The Skempton ‘B’ parameter was quantified prior to the deformation tests and found to be stress dependent. A distinct stress dependency of elastic moduli is also observed, but normalized with the undrained shear strength there is only a relatively small variation. Within the explored stress range the different stress paths to peak indicate a transition from over consolidated to rather normally consolidated state. However, failure is in all cases dilatant, i.e. associated with a drop in pore pressure and strain-softening (more so at low effective stress). Caprock shales of similar porosity to the Opalinus share many similarities in overall behavior, but also exhibit some slight differences.